If I had 33 hours in a day, it wouldn’t be enough to create all I WISH I could! Here is an assortment of the things currently available. Producing my own things helps to form my own personal world of design, as I see it, that I so enjoy extending into my projects. • Some are new decor items I just had to have or make to share. • Some are pieces I upcycle and reinvent. • Some are objects of beauty I think are lovely unto themselves. • Some are of my own making, from years of experience designing, folding, carving, printing. Sought after decor, these hand loomed cotton kilims, or “flat weaves”, come all the way from Nepal. They are incredibly well made, last forever, simply stunning and a forever source of beauty in any room. PLUS, recently, Weinrib closed her shop after years and years, and so these beauties are some of the last available around! $337-3.5x5.5. $393-2.5x9. $799-6x9. Shipping TBD or available for pick-up. Limited inventory. Reinventing a great chair or footstool is so much fun. I have multiple pieces available. 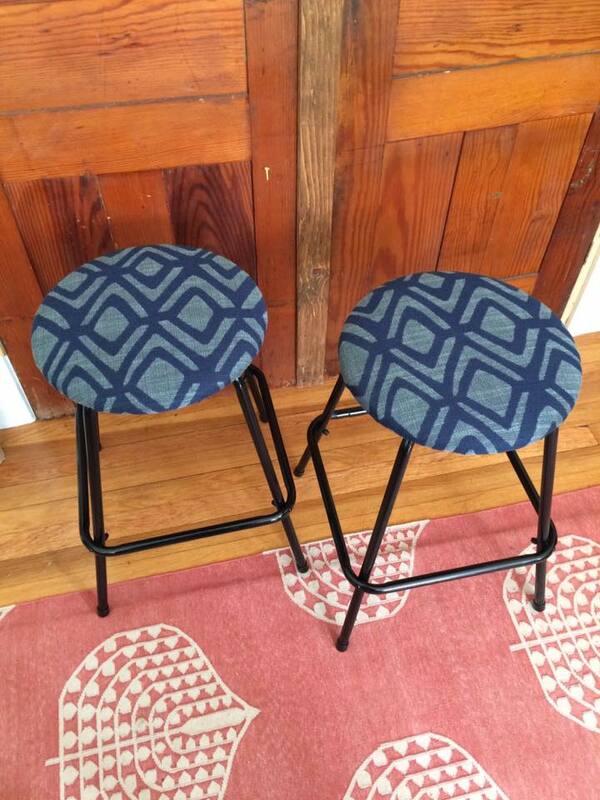 Featured here, some swank vintage stools, great for eat-in kitchens or home office. ; new trade-only upholstery fabric by Hable Construction, fresh paint and padding. Super cute:) Almost hard to part with these! Ask me about my other cool items! $125, pair. 22.5" high x 15" square/wide x 13.75" seat diameter. I am amounting an amazing collection of found vintage art. Sooner than later, I need to sell some of them or get some more walls:) I have a knack for sussing these out and can do so for you. $35-400, depending on source goods + framing costs. I love old houses. I love printing. So, I designed a custom print package that includes: a hand-carved stamp of your home, sized for greeting cards, for you to use over and over; a simply framed “full” print of your house; a set of 10 cards + colored envelopes, each one different; and an ink pad. $350 for the set. Details TBD upon order. I have a selection of various beautiful pillows sure to add a pop of interest to your space. The easiest way to change a touch of design in any room, for sure! $40-175, depending on current inventory. All available for review in my studio.